Who are the “remnants” often mentioned in the Bible? Is there a remnant alive today? Paul once asked to church at Rome, “has God rejected his people? By no means! For I myself am an Israelite, a descendant of Abraham, a member of the tribe of Benjamin” (Rom 11:1) but then answers his own question by writing that “God has not rejected his people whom he foreknew” but in fact, “Do you not know what the Scripture says of Elijah, how he appeals to God against Israel? “Lord, they have killed your prophets, they have demolished your altars, and I alone am left, and they seek my life” (Rom 1:2-3)? Then Paul asks, “what is God’s reply to him? “I have kept for myself seven thousand men who have not bowed the knee to Baal.” So too at the present time there is a remnant, chosen by grace” (Rom 11:4-5). So the remnant that Paul speaks about is the remnant of Israel “who have not bowed the knee to Baal” and today, there is a faithful remnant, not all of them Israel, who God has chosen to be saved “by grace [so] it is no longer on the basis of works; otherwise grace would no longer be grace” (Rom 11:6). This is what Paul says in Ephesians 2:8-9 that it is “by grace you have been saved through faith. And this is not your own doing; it is the gift of God, not a result of works, so that no one may boast” (Eph 2:8-9). 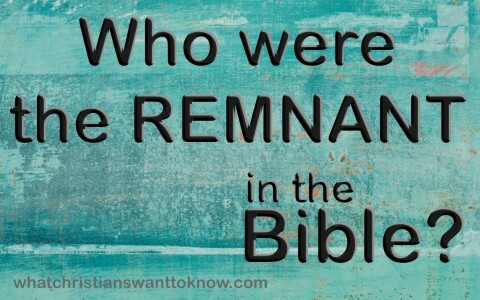 Is there a remnant today? God said, through Paul, that since “Israel failed to obtain what it was seeking. The elect obtained it, but the rest were hardened, as it is written ‘God gave them a spirit of stupor, eyes that would not see and ears that would not hear, down to this very day” (Rom 11:7-8). Jesus rebuked the self-righteous Pharisees by telling them that it was “For judgment I came into this world, that those who do not see may see, and those who see may become blind.” Some of the Pharisees near him heard these things, and said to him, “Are we also blind?” Jesus said to them, “If you were blind, you would have no guilt; but now that you say, ‘We see,’ your guilt remains” (John 9:39-41). This is why Jesus spoke to them in parables saying, “I speak to them in parables, because seeing they do not see, and hearing they do not hear, nor do they understand” (Matt 13:13) and so “Let them alone; they are blind guides. And if the blind lead the blind, both will fall into a pit” (Matt 15:14). They were blind to the truth of God just as we once were. We are no better than they because it was only by God’s grace that He opened our blind eyes to see and our closed ears to hear. There is still a faithful remnant of God but most of them are not Jewish but like most of us; Gentiles. And “although a wild olive shoot, were grafted in among the others and now share in the nourishing root of the olive tree [so we should] not be arrogant toward the branches (the Jews). If you are, remember it is not you who support the root, but the root that supports you” (Rom 11:17-18). Why would we ever feel superior because it was only by “the kindness and the severity of God: severity toward those who have fallen, but God’s kindness to you, provided you continue in his kindness. Otherwise you too will be cut off” (Rom 11:22) because “just as you were at one time disobedient to God but now have received mercy because of their disobedience, so they too have now been disobedient in order that by the mercy shown to you they also may now receive mercy” (Rom 11:31-32). When Israel was in captivity, Ezra wrote that “now for a brief moment favor has been shown by the Lord our God, to leave us a remnant and to give us a secure hold within his holy place, that our God may brighten our eyes and grant us a little reviving in our slavery” (Ezra 9:8) and why he prayed, “O Lord, the God of Israel, you are just, for we are left a remnant that has escaped, as it is today. Behold, we are before you in our guilt, for none can stand before you because of this” (Ezra 9:15). Isaiah the Prophet, in writing of a day that is yet come in the future for Israel that “In that day the remnant of Israel and the survivors of the house of Jacob will no more lean on him who struck them, but will lean on the Lord, the Holy One of Israel, in truth” (Isaiah 10:20) and so “A remnant will return, the remnant of Jacob, to the mighty God” (Isaiah 10:21) and in that day, there will “be a highway from Assyria for the remnant that remains of his people, as there was for Israel when they came up from the land of Egypt” (Isaiah 11:16). Today’s remnant is those who have been called to repentance and faith in Christ. It is not by race but by grace that we are called and saved from the coming wrath of God. God has promised that “After this I will return, and I will rebuild the tent of David that has fallen; I will rebuild its ruins, and I will restore it, that the remnant (literally, “the rest”) of mankind may seek the Lord, and all the Gentiles who are called by my name” (Acts 15:16-17) so only a remnant of the Gentiles will be saved who God calls by name and even “Though the number of the sons of Israel be as the sand of the sea, only a remnant of them will be saved” (Rom 9:27) just as only a remnant of humanity that trusts in Christ. That matches what Jesus often said, “many are called, but few are chosen” (Matt 22:14) or only a remnant will be saved so we must “Enter by the narrow gate. For the gate is wide and the way is easy that leads to destruction, and those who enter by it are many” (Matt 7:13). Many are called but only a remnant is chosen by God (Eph 1). Many enter the gates of destruction but the narrow gate allows only a few to enter. If you have repented of your sins and trusted in Christ, then you are part of that remnant that God has saved. He has saved them for His glory, not that they (or we) are worthy of being saved or called. This establishes the fact that salvation is fully a work of God so that He alone receives all honor, glory, and praise; just as it should be.